After Deadly Crackdown In Bahrain, Human Rights Activists Warn Of Worsening Situation : Parallels In recent weeks, protesters have been killed and arrested, an opposition party dissolved and an independent newspaper closed. Some accuse President Trump of prioritizing arms sales over human rights. President Trump and Bahrain's King Hamad bin Isa al-Khalifa met in Riyadh on May 21. "Our countries have a wonderful relationship together, but there has been a little strain, but there won't be strain with this administration," Trump said. On his visit last month to Saudi Arabia, President Trump devoted special attention to the U.S. alliance with Bahrain, a major non-NATO ally that is home to the U.S. Navy's Fifth Fleet. 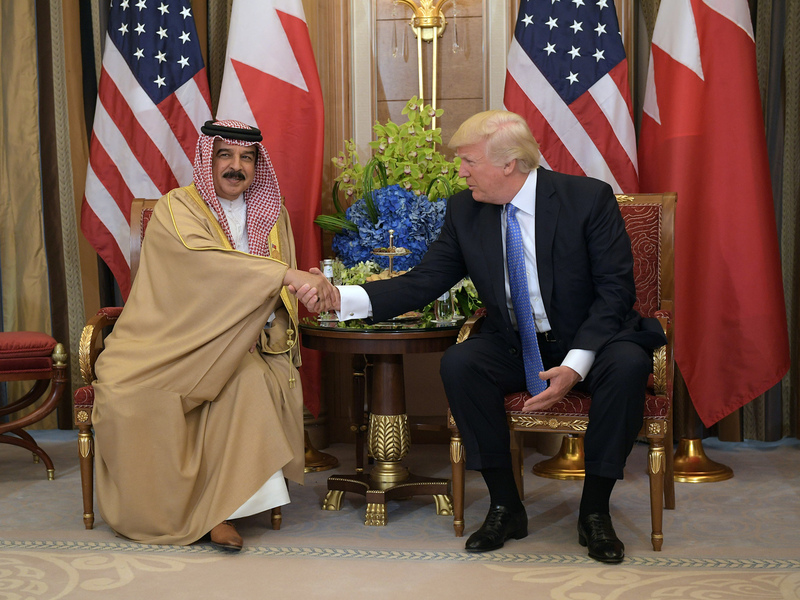 During a bilateral meeting with King Hamad bin Issa al-Khalifa, Trump told the monarch that Bahrain would not experience the same "strain" there'd been with Trump's predecessor, President Obama — whose administration had linked military sales to human rights. In the days that followed Trump's meeting with the king, Bahraini authorities cracked down on domestic opponents. The country's security forces used deadly force to clear a longstanding sit-in around the house of Bahrain's foremost Shiite religious leader, Ayatollah Sheikh Isa Qassim, whose nationality had been revoked in June 2016 over charges of "creating an extremist sectarian environment." Last month, a Bahraini court also charged Qassim with laundering alms money, and he was handed a one-year suspended prison sentence. The May 23 raid on the sit-in left five protesters dead and hundreds of others arrested. Bahrain's interior ministry said 19 policemen were also injured. One woman came forward with an account of torture at the hands of state security, which she said included sexual assault and threats that her daughter would be raped. A secular opposition party was ordered dissolved and Bahrain's sole independent newspaper was shuttered. Amnesty International warned that "Bahrain is now heading towards total suppression of human rights." The small Persian Gulf island country is ruled by a Sunni monarch who's closely allied with Saudi Arabia. Most of the population is Shiite, as is the bulk of the opposition. The suppression of dissent has thus taken on a sectarian tone, and reverberates in a regional already sharply divided by the wars in Syria, Yemen and Iraq. Bahraini human rights activists say unrestricted U.S. backing for the monarchy is encouraging an atmosphere of impunity. They see Trump's public assurances to Bahrain's monarch about ending "strain" as a turning point. "This was seen as a green light to the massive human rights crackdown on all forms of dissent in Bahrain," Sheikh Maytham al-Salman tells NPR from Beirut. A leading human rights activist and a Shiite, Salman is staying outside Bahrain for now, out of concerns he will be detained in his home country. His cousin, fellow human rights defender Nabeel Rajab, has been in jail for his activism for the past year. "It's very unfortunate that President Donald Trump has not taken a position in either reminding the government of Bahrain or other governments of their human rights commitments, and this clearly indicates that human rights are not a priority," Salman says. During the Obama administration, a multibillion F-16 fighter jet deal with Bahrain was delayed. The State Department linked its final approval to tangible improvements on human rights — namely, safeguarding freedom of expression and accountability for abuses. "What Trump did, or what his administration did, is lift this condition," says Salman. While the deal has yet to be finalized, Congress is unlikely to block it. "What's happening in Bahrain is not only a human rights issue. What's happening in Bahrain is a geopolitical issue," Salman says, referring to the regional competition between Sunni Saudi Arabia and Shiite Iran. "Bahrain is in the middle of a very tense region with sectarian alignments, wars based on identities," he explains. "Therefore, when Bahrain targets and practices systematic discrimination against 65 percent of the religious demography [Shiites] and revokes the nationality of the highest religious authority for 65 percent of the religious demography, obviously this will lead to further tensions — not only in Bahrain, but in a very tense region." Salman says Bahrain's Shiite majority is marginalized from participation in national institutions including the judiciary and security forces. "They've been segregated and marginalized from all these positions for decades," he says, "so when you have a police force that deals with the majority of citizens of the country and probably less than 5 percent of the police force are Shiites, it's very natural for these tensions to rise and grow." Salman says extremists on both sides have fueled tensions in Bahrain: hard-line television stations and newspapers have issued calls to "purify" Bahrain of its Shiite population. Earlier this year, an exiled Bahraini cleric in Iran called for the Shiite community to choose the path of "resistance," implying an armed struggle against the Bahraini monarchy. Still, Salman does not believe that Bahrain will experience a violent escalation "at this stage," in part due to the firm anti-violence stance of Ayatollah Qassim — who remains in his hometown of Diraz — and other prominent opposition leaders. Salman says his own experiences of torture at the hands of Bahrain's authorities during the country's Arab Spring-inspired protests of 2011 — which were also met with force and a crackdown on activism — only hardened his commitment to ending human rights abuses. But he warns the monarchy is closing off channels for peaceful dissent. "When Ayatollah Isa Qassim, who not only denounces violence, but forbids, on religious grounds, all forms of violence or the use of arms — when he's targeted, this obviously paves the way for the use of violence," he says, suggesting there could be a possible escalation of opposition tactics. Salman hopes the U.S. will change its policy and place human rights back on the agenda. He says if there is one thing the Gulf monarchies do care about, it's their image on the global stage.